Of all the pricey gadgets in the world, why the hate for the “Juicero”? “Double witching” weirdness… tax cuts by executive order… The 5 addresses one of our most burning reader questions… and more! It turns out Washington state is a mecca of high-end bong manufacture. 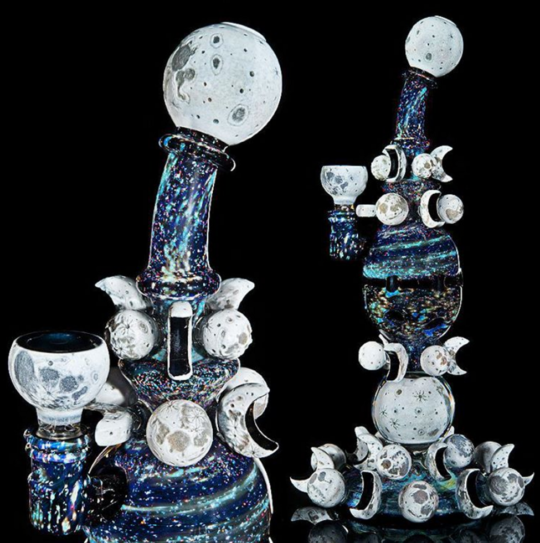 The premier producer, we’re told, is an outfit called Mothership — which has sold two six-figure pipes at auction in the last couple of years. Its signature product is a more affordable $2,800 model called the Fab Egg. Mothership launched only five years ago, and its earlier output has become as collectible as rare coins or baseball cards: “We’ve sold pieces for $1,000 back when we started, and now they’ve resold for $80,000,” says co-founder Scott Deppe. [Ed. note: Even if you’d never buy a $100,000 bong, wouldn’t it feel nice if you could? If you had that sort of money to burn? If you jump into the right penny pot stock at the right moment, that’s totally doable. And our market-timing service Penny Pot Profits aims to make it happen. To mark 4/20, we’re extending an unprecedented offer on this premium-level trading advisory. It’s available only through midnight this Sunday. To the markets, where weirdness often lurks on the third Friday of the month. Strange things have been known to happen on these days, especially during the last hour of trading. But for now, all’s quiet. The major U.S. stock indexes are little moved. The Dow industrials are slightly in the green; the S&P 500 and the Nasdaq are slightly in the red. Gold is up a bit at $1,283. Treasury yields are down a bit, the 10-year at 2.21%. The big economic number of the day is existing home sales, and they surprised on the upside — leaping 4.4% in March to the highest level in a decade. Supply is still tight; the typical existing home for sale spends only 34 days on the market — down from 47 days a year ago. More weirdness: What first looked like an act of terrorism now looks like an especially sick act of financial manipulation. You might recall the news a few days ago about a bomb attack in Germany targeting a bus carrying the Borussia Dortmund soccer team; one player suffered a minor injury. Police found letters near the scene indicating links to ISIS. But on further investigation, that now appears to have been a ruse, and a dual citizen of Germany and Russia is under arrest. Police say he bought put options on the team’s publicly traded shares. That is, he was betting the share price would fall after the attack and he’d get a huge payday. The scheme might have worked were it not for the fact he was staying at the same hotel as the team, and that’s where police say he executed the trades. As if the cops weren’t going to comb through every kilobit of internet traffic in the vicinity, right? OK, we don’t get it: Why are the interwebz hating on the maker of a $400 juicer? 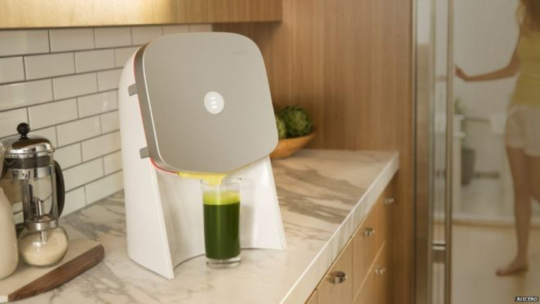 Among the items your editor noticed on his first bleary-eyed news cruise this morning was one about a machine called the Juicero, getting relentlessly mocked on social media. The Juicero launched last month after the startup firm behind it raised $120 million in funding. Because it’s a Silicon Valley startup, of course the Juicero is Wi-Fi enabled. It comes with a smartphone app with which you can order replacement pouches; it can also send you alerts if the pouches approach their expiration date. It’s an internet-of-things thing. What’s not to like? But the squeezing revelation forced the hand of Juicero CEO Jeff Dunn, a former Coca-Cola exec, and he took to the defense of his product at the website Medium. Unfortunately, Dunn tried a little too hard and dug his hole deeper: “The value of Juicero is more than a glass of cold-pressed juice,” he wrote. “Much more. The opprobrium is so severe that Juicero is now offering refunds. For a product that’s totally safe and works as advertised. What are we missing? Bonus points for irony: After I was done with headlines at the BBC, I moseyed over to The New York Times, where the first ad I saw was for… a $500 ice machine. 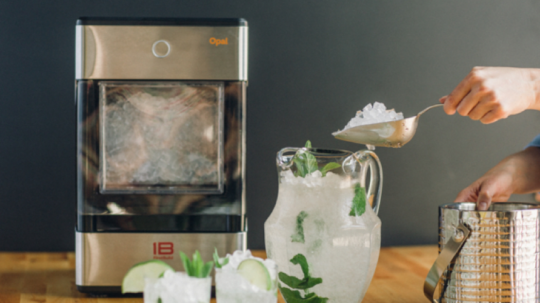 Behold, the Opal Nugget Ice Maker, “an affordable nugget ice maker for your home,” says the website. All we’re saying is that there’s no shortage of high-end gadgets catering to people who’ve got more money than sense — including handcrafted $10,000 glass bongs. Why is the Juicero getting singled out? We’re now exactly one week out from a new “partial government shutdown.” Only with Trump in the White House, it’s taking on a weird character. As we’ve mentioned periodically this week, Congress is under the gun to pass a “continuing resolution” to keep the government funded through the end of September. The Dow sailed up 180 points yesterday, in part because of those news items. And it’s all too much for our David Stockman. “What the Kool-Aid drinkers on Wall Street don’t get,” he writes this morning, “is that the dynamic that played out on the Obamacare repeal and replace fiasco wasn’t a one-off outcome or owing to mistakes of tactics and timing. Reality will set in sooner or later… and David says it’ll be a double-whammy combined with a “weird pattern” that’s preceded every crash for the last century. (More weirdness!) Indeed, David believes it could kick in before the close today, or certainly next week. If you haven’t seen his warning, we direct you to it now because it’s coming offline tonight. “Can President Trump,” begins today’s mailbag, “unilaterally declare a tax holiday of some sort to repatriate dollars that corporations hold overseas, money that would otherwise be subject to confiscatory tax levels? Maybe under the guise of a national emergency? “Seems to me that a massive infusion of existing overseas dollars into the economy would be hugely bullish for the markets and more easily accomplished than getting the Fed to squirt some more fiat electrons into the ledgers. But heck, I’ll confess to naiveté here. The 5: One of the few dictates of the Constitution that Washington still follows is that changes to the tax code must begin in Congress. In theory it’s possible the president — any president — can justify executive action by citing a “national emergency.” But a president still needs to be mindful about retaining the consent of the governed. It didn’t work out very well when Truman tried to nationalize the steel mills in the early ’50s, justifying it on the grounds that the Korean War was a national emergency. The matter went to the Supreme Court, which slapped him down 6-3. “I am getting frustrated,” a reader writes, “that there is always another subscription I have to buy to get more info on the latest trend, as in the case of the pot stocks now. “The money out of pocket is too much to handle for an investor like me. I want to participate, but it seems as if you guys are dividing up every trend individually to charge more for a new subscription. Maybe it will make money in the long run, but I still have to come up with the money now to invest in an uncertain future. “My understanding was that signing up and paying money for the subscriptions I already have with you would be all-inclusive to all research. Apparently not. I have already spent thousands of dollars with your company. Why can’t you at least give substantial discounts to current loyal subscribers? So here goes: When we as a firm came around last year to the idea that marijuana investing was no longer the equivalent of buying a lottery ticket, we charged Ray Blanco with assembling a portfolio of penny pot stocks that would be suitable for the small investor. We published that research in his entry-level newsletter, Technology Profits Confidential, in part because many of those names are biotech firms that happen to be working with cannabis. These are long-term “buy and hold” plays good for at least months, and ideally for years. In the course of his research, Ray also discovered the potential to trade pot stocks short term — jumping in and out for big gains in a matter of only weeks. He and our team developed a proprietary trading system, and we launched Penny Pot Profits in mid-February. The plays in Penny Pot Profits have a much higher profit potential in a much shorter time frame… but that higher reward comes with higher risk. One reason we charge the much higher subscription fee is to limit access for people with less investing experience. If “the money out of pocket is too much” for you to handle, then you should stick with Ray’s recommendations in Technology Profits Confidential. Ideally they’ll work out well enough that in time you’ll be able to step up to Penny Pot Profits. P.S. If you do feel comfortable with stepping up to the next level of penny pot stock trading, we’re offering an extraordinary “4/20” discount on Penny Pot Profits through this weekend only. We’ll send you another reminder on Sunday just before the offer expires… but if you want to take your time and examine the possibilities, we invite you to click here right now.